Running with Penguins | Antarctica 2012 Marathon | Dean Schuster » How many runners will I catch at the Governor’s Cup 1/2 Marathon? How many runners will I catch at the Governor’s Cup 1/2 Marathon? 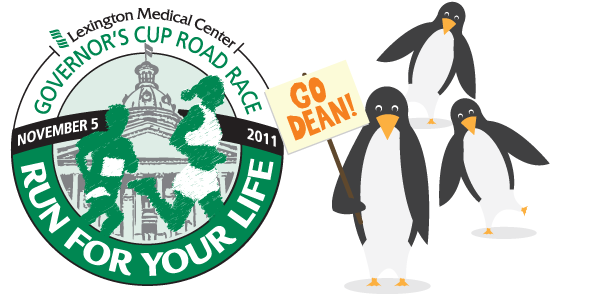 At the 2011 Governor’s Cup Half Marathon this Saturday (Nov. 5th) a weirdo in a penguin suit will start the race in last place. As the mascot for team LexMed, I care about fitness and aim to catch as many runners as possible. I want you to donate to support penguin conservation based on the number of runners I beat. But how many runners will fall to the penguin? I’m targeting a sub two hour finish. Sure, the suit is hotter than a sauna on the surface of Venus. Sure, I can breathe only through a one-inch gap at the base of the enormous mask. And yeah, I won’t be able to see well at all. But I’m feeling spry. If I achieve my goal, I’ll beat about 55%-60% of the field. At between 700 and 800 half-marathoners, I may very well catch as many as 400. I will show no mercy on Blossom street. Send me a note if you want to pledge an amount per runner I catch. I’ll post the results, and you can do some grammar school math to determine the donation!